I don't watch a whole lot of TV... a little bit of "The Office" and I catch "Family Guy" or "Letterman" once in a while, and while I'd love to watch my Chicago Cubs, I'm not too keen on paying for cable just for that. 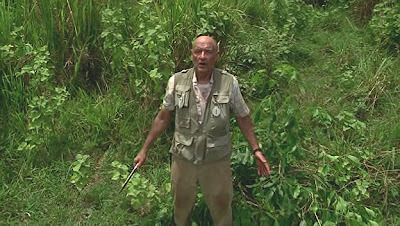 Fortunately, the one show I definitely gotta see is on network television: "Lost"! While waiting until Season 4 begins to air in February 2008, I'm getting my fix by re-watching Seasons 1 and 2 on DVD. It's been so long since I saw these episodes, I've forgotten a lot of things. That's why I'm taking notes... yeah... not that I'm going to figure out any big mysteries, but the show has some interesting themes and plot elements, and some are quite spiritual. While one of the writers is Jewish and I don't think the other is Christian, they seem to like drawing in Catholicism with confessional scenes (Charlie and Mr. Eko), references to saints (Kate chose St. Lucy for Confirmation), and even Mr. Eko playing priest to escape his home country. And then there's this John Locke character. Off the island, he's disrespected and alone, out of place at his collar-and-tie office job. On the island, he's "the hunter," a master at following tracks through dense forests, throwing knives with scary precision, and a man of faith. Not Christian faith, but a believer in fate and knowing there's a reason for the things that happen to us. He lives in this strange communion with the Island. He seems to follow some unseen force -- at times getting lost -- until realizing he was a fool to lose faith. St. Francis seemed to be a lot like that. While he did benefit from notable miraculous encounters, especially hearing Jesus' words from the San Damiano crucifix, most of the time Francis was just trying to figure out the next step to take -- and even after receiving his marching instructions, "Rebuild my Church," he initially misinterpreted the meaning. See, even though Francis wanted to be a knight, I don't think his heart was in fighting military battles. I think he knew there was something else for him, but volunteering for a Crusade was the closest thing he could find to whatever "it" was. When he jumped off his horse to embrace a diseased leper, he certainly wasn't following any direct command from God -- he must've had that distinct feeling in his gut saying, "I don't know why, but I have to do this." Surely he had passed other lepers and felt drawn to jump down and embrace them, but this time the impulse couldn't be ignored. He was following a greater, unseen force -- what greater adventure is there? Maybe that's part of the reason Locke seems like such a manly, adventuresome guy on the Island. Sure, throwing knives and tracking through the forest is cool, but he's clearly driven by a greater force. Sometimes I relate to that feeling, when I find myself make a decision not because it really makes sense at the time, but because it feels like the right thing to do at that time. I had that feeling about getting into a dating relationship last year, even though I felt so strongly about pursuing the priesthood. Of course, the relationship fell through (as it was destined to do because we weren't very compatible) and life sucked for a while, but there's something about opening your heart to another person (not just in dating, but also friendships) that reveals your deeper needs and motivations. Having been through a bit of an emotional roller coaster throughout the past year, now I have that same gut feeling about beginning the application process for seminary. I don't know if I'll eventually end up ordained or married, but when St. Francis had his dream of becoming a knight in the king's court, or heard Jesus' voice from the crucifix, or wrapped his arms around that leper, he didn't know much more than I do now. Ain't nothing wrong with that... besides, where's the adventure in knowing exactly where you're going?